James Milton Campbell Jr. was born on 7 September 1934 on Duncan’s Plantation on the outskirts of Inverness, Mississippi, the son of blues singer Big Milton Campbell. Little Milton fell in love with the guitar while listening to the Grand Ole Opry and bought his first six-string instrument for $14.40 from a Marshall Field catalog with money he saved from picking cotton. He cited influences such as Eddie Arnold, Ernest Tubb, Frank Sinatra, Roy Brown, and Sammy Davis Jr. His first professional job was with Leland bluesman Eddie Cusic. Little Milton later moved north and along with Ike Turner helped establish East St. Louis as a hub for blues music, playing at juke joints such as the Dynaflow, the Birdcage, and Chappie’s Lounge. Little Milton made his debut in the mid-1950s on Memphis’s Sun Records. Soon after Milton cut his raucous sides, however, renegade producer Sam Phillips turned his attention to a young white singer with matinee idol looks, Elvis Presley. Undaunted, Milton traveled to St. Louis and recorded for the Bobbin label. Not until the 1960s did Little Milton truly develop his style and make his name on the Chess record label, home to such stars as Chuck Berry, Bo Diddley, and Muddy Waters. Little Milton had a No. 1 R&B hit single in 1965 with “We’re Gonna’ Make It,” a song that resonated with the civil rights movement. Milton’s Chess sides reveal a soulful baritone, stinging guitar licks from his hollow-bodied Gibson, and lyrics reflecting his independence as both a musician and a man. This combination provided all the elements of a form of blues recognized as soul blues, a musical genre distinguished by passionate, gospel-tinged singing, punchy horns, “chicken-scratch” plucked guitars, and tight rhythm sections. Artists who wanted to move stylistically beyond the three-chord confines of conventional blues forms found the rhythm and blues strain of the 1950s and the southern soul style of the mid-1960s more to their creative liking. Soul blues was a fusion of Memphis blues and popular soul music that since its inception has been played by black artists for black audiences. 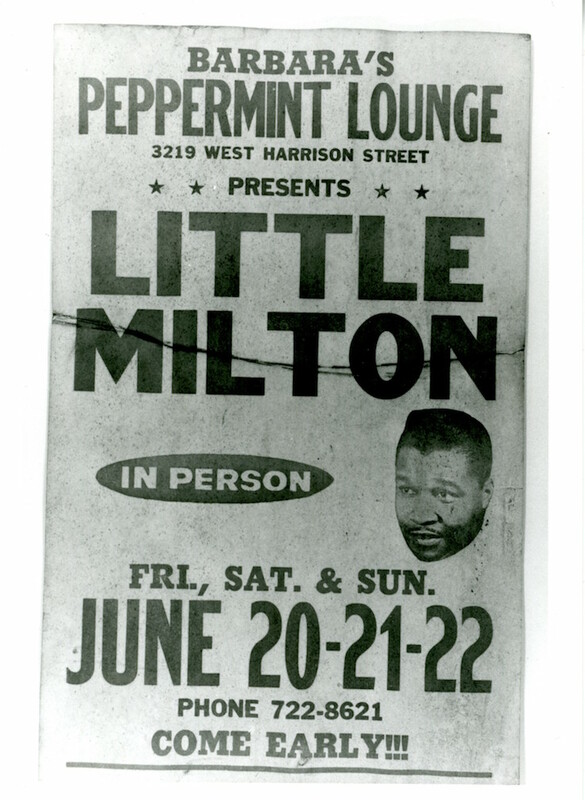 The audience for Little Milton’s music was on the Chitlin’ Circuit, the string of black-owned clubs and theaters serving the entertainment needs of the often-segregated black community. Milton’s music, particularly “We’re Gonna Make It,” spoke to the revolutionary possibilities of the 1960s. Little Milton signed with the Memphis-based soul label Stax in 1971. At Stax, Milton expanded his studio sound, adding bigger horn and string sections and spotlighting his soulful vocals more than traditional blues. His Stax-era hits included “Annie Mae’s Café,” “Little Bluebird,” and “That’s What Love Will Make You Do.” After Stax went bankrupt in 1975, Little Milton moved to Jackson-based Malaco, which found a niche with a core group of session musicians and songwriters, many of them former Stax employees. Little Milton’s first Malaco single, “The Blues Is Alright,” became the signature blues anthem and reestablished his presence as a major blues artist. Milton’s later work for Malaco incorporated strings, horns, and background vocals to full effect. In 1988 Little Milton won the W. C. Handy Award for Blues Entertainer of the Year and was inducted into the Blues Hall of Fame. He on died 4 August 2005 in Memphis. Keywords Little Milton, James Milton Campbell, Jr.